Did you know that 70% of the attachments you receive by email are PDF files? You may not realise it yet, but you already have all the tools you need to work efficiently with these documents! They are secretly hidden (whoops...maybe not, as there are about 16 million people per month that are using them) behind this magical colourful cube called Smallpdf. They are so easy to use that I’m sure they will become your best friends! Whether you’re sending an email, preparing a presentation, signing a document or trying to edit your file in its original format, this little guy has got you covered. With Smallpdf, you can save up to 2 hours per week that would have been spent on document challenges! Exciting isn’t it? Click on the extension and all the tools will be revealed! We also detect the last tool that you have used and will place it at the top of your personal list. If you cannot find what you are looking for, simply use the search bar to find the tool you need to solve your problems! Browse the web as you wait for your file to process. Smallpdf will notify you once your file’s ready to be downloaded! … and here’s what you can do with our super powerful free tools! Do we really make PDF easy? 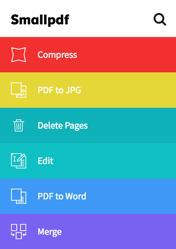 Let us know by reviewing Smallpdf on the Chrome Store.